Democratic leaders aren't going to shut down the government to save Dreamers in December. Senate Minority Leader Chuck Schumer and House Minority Leader Nancy Pelosi haven't stopped fighting to deliver something on immigration by the end of the month. But they've subtly shifted their rhetoric in recent days and aren't insisting that deportation relief be paired with a government funding bill this year. Top Democrats' retreat from demands on a deal before 2018 ensures they won't get blamed for a possible shutdown and won't upend Senate talks on a bipartisan deal combining relief for Dreamers with border security. Those negotiations appear to be gaining momentum and may well bear fruit this month, particularly once Republicans reach a final agreement on their long-sought package of tax cuts. "This is something that the president said he wanted to do. This is something that has a broad bipartisan majority," said Sen. Brian Schatz (D-Hawaii), a member of Schumer's whip team. "Whether we get it done this week or next week, or this month or next month, I think remains to be seen." Schatz added that he is concerned about doing right by immigrant groups and other key members of the party's grassroots that are desperate for a fix before 2018. "Obviously I want a Dreamers fix by the end of the year," Sen. Chris Murphy (D-Conn.) said in an interview. "I'm not sure that it serves our purposes to draw hard lines in the sand in the middle of negotiations." "Democrats are not willing to shut government down, no," Pelosi said late last week when asked how far Democrats would take the fight over Dreamers this month. "As I said, that is part of our priorities that are listed here, and there may be some more." Democrats are loath to be pegged as responsible for shutting down the government this month. And with Ryan and other leaders saying publicly that they have no plans to couple a legislative fix for Dreamers with spending talks this month, Democrats' best option may be to push the issue to January. Democrats would "put the whole negotiating process at risk by" courting a shutdown, said Sen. Thom Tillis (R-N.C.). "This is about fixing it for the DACA kids." And it's unclear if an agreement from both sides to help Dreamers early next year would be enough to quell the anger of Democrats' most passionate lawmakers and immigrant advocacy groups, who have criticized Democratic leaders for failing to secure a Dreamer deal back in September. "If Congress goes home for Christmas and leaves Dreamers in the cold, there will be a grassroots uprising that will scorch every legislator who fails to do what's right," Ben Wikler, MoveOn.org's Washington director, said in an interview. Promising discussions about a bipartisan solution that would include saving Dreamers and boosting border security are happening in the House as well as the Senate. But those talks are being kept tightly under wraps for now and multiple Democratic aides said privately they don't foresee a scenario where DACA is addressed this year. For Democratic leaders it's a delicate dance. They don't want to admit that a DACA deal looks like a longshot now and risk angering their members and progressive groups. But they also are wary of making immigration central to government funding talks and getting tagged by Trump and other Republicans as willing to shut down the government over the issue. "The only person who's been tweeting about shutdowns is Donald Trump," Sen. Chris Van Hollen (D-Md.) said in an interview. "So if he really wants to precipitate a shutdown, that's on him." 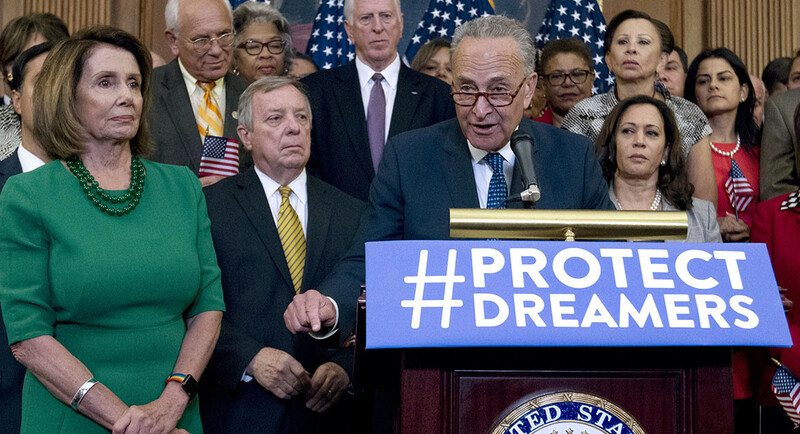 Still, Democratic leaders know an agreement with Republicans to move forward in January may not be enough to soothe Hispanic lawmakers and advocates who are still angry Schumer and Pelosi failed to secure a Dreamer fix in September when they cut a spending deal with Trump. Trump "backed out on" a previous deal on immigration earlier this year, recalled Angel Padilla, policy director at the liberal group Indivisible. "I would not trust that a handshake deal would get us what we need." "I think we should've frankly been more assertive in September," House Minority Whip Steny Hoyer (D-Md.) said Tuesday. Hoyer also raised his concerns at a private caucus meeting in September, saying Democrats should have withheld their votes for a spending bill at the time. Given the bipartisan engagement on the issue, "I do not want to participate in creating an environment in which anything looks like an ultimatum that can be used by the Republicans to shift the blame for a shutdown," Sen. Sheldon Whitehouse (D-R.I.) said. "So for now, I'm satisfied to see the progress that continues to be made."